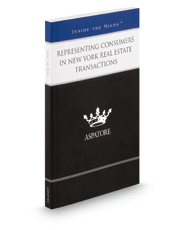 Representing Consumers in New York Real Estate Transactions provides an authoritative, insider's perspective on assisting clients in closing residential and commercial property deals. Experienced partners from law firms across the nation outline unique aspects of the law, including taxes and zoning restrictions, and identify key strategies for navigating property selection and offer processes. These top lawyers offer specific advice on assisting clients in starting a title action, discussing commonly litigated areas in the industry, and analyzing current trends in the law, including an increased focus on Airbnb, as well as rents and affordable housing. From successfully undertaking the real estate purchase and loan application processes to assisting clients with contract negotiations, these experts ensure loan documents match with initial agreements and divulge best practices for avoiding predatory lending practices. The different niches represented and the breadth of perspectives presented enable readers to get inside some of the great legal minds of today, as these experienced lawyers offer up their thoughts on the keys to success within this dynamic legal field.